The Undergraduate Council voted to allocate the Palestine Solidarity Committee $2,050 to host Israeli Apartheid Week at Sunday’s general meeting. IAW is an international movement across college campuses to raise awareness of Israel’s treatment of Palestinians. The PSC planned much of the programming of Harvard’s event, which began on March 30 and runs until April 4. The week includes Palestinian speakers, a student panel, an unveiling of a physical Wall of Resistance, and a movie screening. The council financed the event with the special grant because it does not typically give funds of more than $2,000 through its normal grant process, according to Finance Committee Chair Noah Harris ’22. Harris also stated that the event, which addressed the “race relations” interest, does not actually have to improve race relations; it is sufficient for the event to relate to them. PSC Treasurer Katie M. Farkouh ’21 said the organization needed the UC to help finance the event because it lacks sufficient funds of its own. PSC Co-President Christian B. Tabash ’21 said in an interview after the meeting that the group, which is entirely student-run, is “certainly happy” that the UC decided to pass the resolution to grant funding for IAW. “We have no outside funding, and our main purpose is to uplift the voice of the voiceless,” Tabash said. Dozens of students who supported and opposed the Council’s funding of the event attended Sunday’s meeting. Students disagreed as to whether the event allowed for open dialogue among students with opposing views on the Israeli-Palestinian conflict. “One of the main focuses of Israeli Apartheid Week, featured both on their wall and with their speakers, including the founder of the movement is the BDS [boycott, divest, sanction] movement,” Ariel R. Hecker ’21 said. 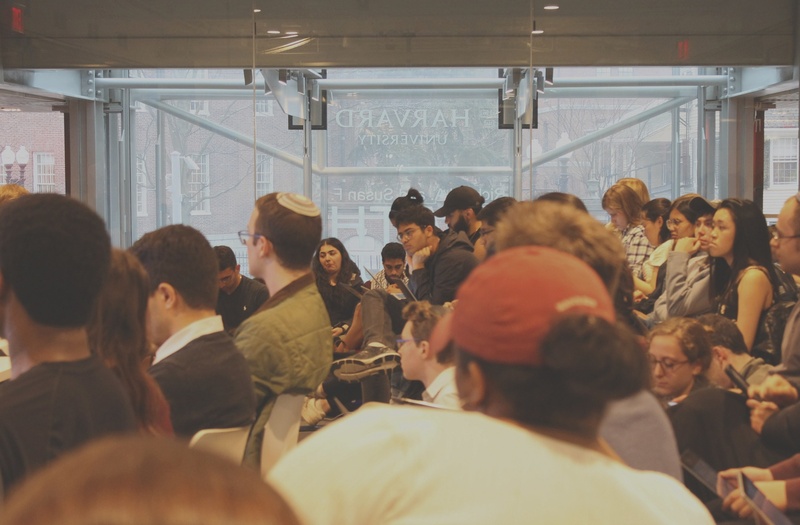 Multiple Jewish students said the event makes them feel uncomfortable because some of the speakers invited to the week’s events have previously endorsed violence against Israeli civilians. PSC supporters said Harvard Hillel has also brought speakers to campus who contributed to military operations against Palestinian civilians. “We can’t have a conversation about this if we are consistently obfuscating the facts of the situation, which is also, by the way, that Hillel has consistently hosted members of the Israeli military who have led operations that kill Palestinian civilians,” Anwar Omeish ’19 said. UC representatives said they support freedom of speech but do not want to provide a platform for speakers who support violence. Harris clarified that UC funds do not support speakers. Though PSC applied for speaker honorarium, accomodations, and travel assistance, event funding was not allocated for those purposes. Instead, the UC funded the venue, food, and decorations. Many council members said they recognize some of their constituents would be offended no matter how they vote. They said they decided to fund the event because it met the requirements of the UC’s Finance Committee, and funding a student event is not necessarily a sign of endorsement. UC Treasurer Jack M. Swanson ’22 clarified to the Council after the vote had taken place that none of the allocated funds will be distributed before IAW occurs because the College has not yet provided the UC with its funds for the semester.